The Gray Report: Gallo's new Russian River Valley vineyard: Good, but does it fit? Gallo's new Russian River Valley vineyard: Good, but does it fit? 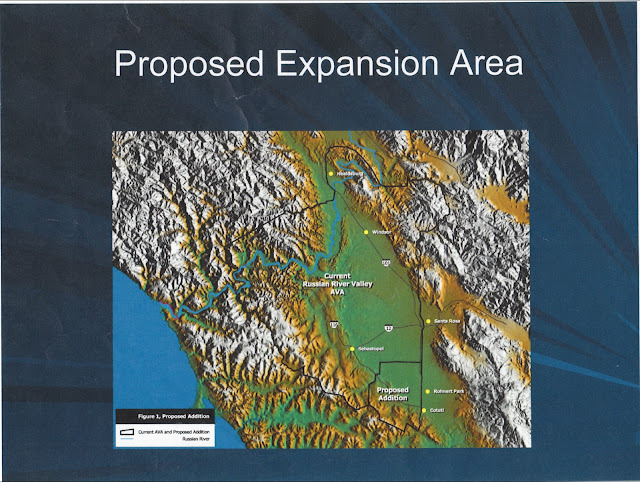 I was unhappy when the US government last month expanded the Russian River Valley. That sounds like the Army Corps of Engineers blasted a path through an obstruction. In fact, it was a major legal victory for Gallo, which owns the 380-acre Two Rock Vineyard that's now in the prestigious RRV appellation. Within a few hours of publishing my complaint, I got an email from a Gallo PR rep. Forgive me if this is inside baseball, but for the small community of us who have tried to write about Gallo in the past, getting outreach from Gallo was earth-shaking. One PR guy who worked for Gallo for some years once told me his job, for a while, was to not return phone calls and not answer questions. They haven't been quite that paranoid for the six years or so I've been reporting on them, possibly because Ernest Gallo is no longer with us. I've never had anyone from Gallo be rude to me, but they also never used to volunteer information. The company philosophy regarding media seemed to be "no news is the only acceptable news." Anyway, I was invited up to see Two Rock Vineyard. Again, earth-shattering: Not sending me a bottle, but offering me a tour and an interview. I asked to do some comparison tasting of wines from the vineyard and from Gallo's other operations in Sonoma County, and was told that could be arranged. How excited was I? I was in France and Italy telling people that I had to get home to see this Gallo vineyard. Winegrower Scott Johnsen in Two Rock Vineyard. My back is to US Highway 101. Two Rock Vineyard is across Stony Point Road from the Washoe House bar/restaurant, and seems to sit on the Cotati side of the border with Petaluma. I'll talk about the climate relative to the Russian River Valley in a moment. But the first thing you notice is that this is cattle country. The Gallo family bought a 500-acre dairy farm in 2001 from a family named Aggio that wanted out of the milk business. Among the neighbors there are many dairy farms. Standing on a hill in the vineyard, you could amuse yourself by counting cows. The Washoe House was my introduction; I had a buffalo burger there before my meeting. Dollar bills are tacked all over the walls and ceiling; it's the place's shtick. People write something pithy on a dollar bill and nail it on the wall. I could have easily paid for my buffalo burger by pulling the bills off the wall next to me. This decoration wouldn't last in San Francisco. Healdsburg? Hmm. Anyway, one thing it shows is affluence among farmers, and that has some resonance with the Russian River Valley. This is not yet an area of nouveau riche, but most likely the TTB's ruling will encourage more of these dairy farmers to plant Chardonnay and Pinot Noir. Currently a Mercedes on Stony Point Road appears to be passing through. But give it time. Gallo winegrower Scott Johnsen and ranch leader Trini Amador showed me around Two Rock Vineyard. Stupidly, I never asked why they call it that, and regret not having a photo of two rocks. It's not beautiful. The vineyard abuts US Highway 101, and now I'll look left to see it when I drive north. There's a very planned-looking lake of reclaimed wastewater used for irrigation. The hills have a gentle roll that I suppose is pretty. But this is working, productivity-focused farmland, not postcard territory. We talked some about Gallo's commitment to sustainability, which I wasn't there to evaluate, and will not comment on today. They're doing some things; they're not certified organic or biodynamic but argue that it's better for the environment to spray occasionally then to bring a tractor through more often, because of the CO2 emissions. Topic drift. I didn't get stats on the climate versus the Russian River Valley. But it's cool, cooler than you expect for a region of Sonoma County still specializing in cattle farming. It gets some breeze from the Petaluma Gap to the south. Johnsen says that it doesn't have the day-to-day or diurnal temperature variation of the Russian River Valley. "Our hots are not as hot and our colds are not as cold," he said. Rain is less; he said the vineyard gets 20 to 30 inches per year. The soil is mostly sandy clay loam. The vineyard is planted with 59% Pinot Noir, 23% Chardonnay, 12% Pinot Gris and small rows of Sauvignon Blanc, Riesling and Gewurztraminer. Deer were running through the vineyard as we drove around; Johnsen says they only nibble at the grapes, but wild hogs are a major problem, tearing off parts of the vine to feed their piglets. To keep flocks of thousands of starlings from eating even one grape each, Gallo hires a falconer from the time the grapes reach 18 Brix to the end of the harvest. But there isn't any forest nearby, you can hear cars whizzing by on 101, and it doesn't feel as wild as it apparently is. Still, who cares about what the vineyard looks like? What matters is the wine. I loved -- loved! 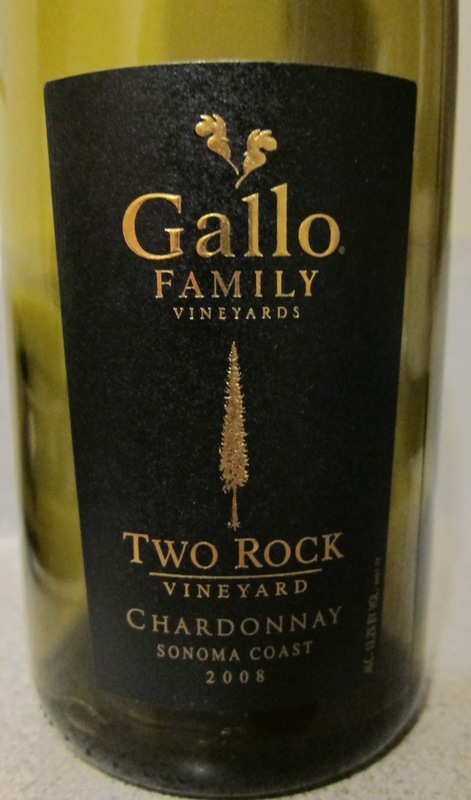 -- the Gallo Family Vineyards Two Rock Vineyard Sonoma Coast Chardonnay 2008 ($28). Absolutely loved it; I took home half a bottle left over from the tasting and my wife and I greedily polished it off, and wished we had more. I would rate it in the low-mid 90s. The wine is really funky on the nose: so earthy that it's almost barnyardy. In fact, I regret pouring out the first glass because I thought all that funk was a glass flaw, but now I think I overreacted. On the palate, though, it's taut with nice lemon fruit and even some minerality on the finish. It's 13.2% alcohol, which is pretty lean for Sonoma County, and had by far the most character of any of the 5 Gallo Sonoma County Chardonnays (some more expensive) that Gallo laid out as a comparison group. Chris Munsell, Gallo's director of coastal winemaking, says the Two Rock Chardonnay reflects Gina Gallo's palate. "She travels all over the world, she spends a lot of time in Burgundy, and she tastes hundreds of wines," Munsell said. "This is the kind of wine she likes." Unsaid was that, even in a period where balance is coming back into vogue, it's not the kind of wine one expects most consumers to like. I guess I'm glad to learn Gina Gallo and I have similar taste, although since I don't exactly hang out with her it doesn't really do me any good. It does explain why I like the sandwiches at Dry Creek General Store: I didn't realize this, but she owns it. But again, topic drift. I also tried the Gallo Family Vineyard Sonoma Coast Pinot Noir 2009 ($35) in a shiner (unlabeled bottle). Munsell said it may not be labeled Two Rock Vineyard when it's released, possibly because of future confusion over the name. Both the Chard and the Pinot from Two Rock had to be called Sonoma Coast in 2009, but from 2012 they can be called Russian River Valley. The vineyard's also a helluva long way from the coast, but Gallo already aided in the distortion of the Sonoma Coast AVA some years ago, so that's terroir under the bridge. Anyway. I liked the Pinot Noir the best of five Gallo Pinot Noirs from Sonoma County, but possibly because of the winemaking. The best thing about it was its silky soft texture. But it wasn't that special: red fruit on the nose, fairly straightforward on the palate. We didn't end up drinking much of it. I'm not here today to rip on Gallo's high-end Pinots, but it just wasn't a great group. What I am here today to do is comment on whether Two Rock Vineyard is a worthy addition to the Russian River Valley. Sorry, but I'm going to say no, the government made a mistake. This vineyard does not belong in RRV. If anything, it makes a good case for the gerrymandering of the Sonoma Coast, because the wines from there taste coastal. Don't misunderstand me. The wines from this vineyard are very good. I loved -- loved! -- the Two Rock Chardonnay. But with its leanness and funky expressiveness, it tasted like a very good Sonoma Coast Chardonnay. Very good Russian River Valley Chardonnays are generally richer, even from people who pick early, and it's unusual for them to be that feral. Quality is important, but it's not the same as terroir. Consumers aren't being ripped off by Gallo's Two Rock wines -- far from it. I'd drink that Chard again any time, and the price is very reasonable. But we are being misled. I'm not 100% sure, but I vaguely recall that consistent with normal Gallo farming policy, those lovely rolling hills you mentioned were artificially contoured to be that way. Gallo obviously has the resources to do whatever it wants. What prevents them from making great wine, in my opinion, is their obsessive need for control (as in bulldozing vineyard land). The other side of the paradigm is the Jess Jackson approach in which you hire talent and give them the latitude to push the envelope. The up-scale Gallo wines are generally good but lack soul. In short, they are corporate wines. Head a little further down the road and you'll find those Two Rocks, complete with historical marker. It's a major geo reference for the area, on the way to Valley Ford and Marshall, on out to the Coast Guard training school. All the cattle areas on the coast are bone-chilling cold brother. That's why they're so well suited for it, because they aren't good for things that need to get ripe. Stagecoachs used to roll up to the Washoe Road House. That puppy is old. But where you really need to go is also down the road just a bit to Stormy's where the beef is big and incredible, the stone fireplace roaring, and the feeling that you're no where near any urbanites allows for a bit of a respite. There are plenty of high end cars out there already, and zoning and local diligence will keep a sudden change in character from happening any time soon, if ever. These hills, btw, are natural, as a further drive also shows. "Johnsen says that it doesn't have the day-to-day or diurnal temperature variation of the Russian River Valley." So their vinyard manager himself says there's a significant difference between Two Rocks and other areas of RRV. If your own vineyard manager isn't convinced, how are you going to convice anyone else? Regarding this comment: "I could have easily paid for my buffalo burger by pulling the bills off the wall next to me. This decoration wouldn't last in San Francisco." Dude!!! You obviously never went to the Gold Spike in North Beach!! Lee: They weren't actually that lovely. Does raise an interesting question, though. Is there anything philosophically wrong with moving earth to create hillside vineyards? I can't think of anything offhand if it doesn't damage -- damage, not change -- the environment. Jay: Normally I agree with you on upscale Gallo wines. They tend to be very good value at $20-$30, but rarely interesting at prices above that. This Chardonnay had a soul. That said, it was still in that $20-$30 range. So we're still in agreement, which feels nice. Jim: That's a good point about cattle farming in Sonoma County. Thanks, it hadn't occurred to me, but should have. I have been through several tastings with Gallo people and found them to be more hospitable than several other large winery groups. Their gray-hairs are very hospitable, knowledgable. and definitely trying to overturn an old image of plunk wines. Ron: Gallo knows what it's doing in pretty much every aspect of the wine business, which is why it's successful. Let's face it, many people disagreed with Gallo over this redistricting. But who had the skills to influence the government? I'll even step outside myself and say Gallo's media strategy shows its savvy. The "no news is the only acceptable news" strategy worked just fine for decades. But it's not going to work anymore (although the Wine Group is employing its own interesting variant, which, like Kaiser Soze, to convince you that the Wine Group doesn't exist. But I digress.) because in the modern wired world, a loudmouth like me writes a post, others pick it up, and there's a brushfire of negativity. So Gallo has quickly learned to interact with the media, and like everything else, has learned to do it well. I don't like or agree with everything Gallo does, but I have to respect it as a family company that's still very effective despite transfer of generational power. Here is an article regarding Gallo's Earthmoving. A side note, I used to live in the area mentioned, and Gallo also had an illegal water diversion from the Russian River going on into a non permitted and very large storage pond, right above my house. Great article! It's without a doubt the most insightful I've read on the whole Gallo / RRV debate! Thanks for taking the time. Just wanted to add that in 2014, according to the Pesticide Use Report, Gallo plastered 382 acres of the vineyard with Lorsban, one of the evil old organophosphate pesticides that is known (from many scientific studies) to be linked to doubling the chances of getting Parkinson's Disease and other auto immune diseases.